My Mashed Potatoes-Cottage Cheese Dumplings recipe is a wonderful way to use leftover mashed potatoes. I went to a Farmer’s Market two weeks ago and bought the biggest cabbage I have ever seen. Since then, I have been getting great use of that one $2.50 purchase. 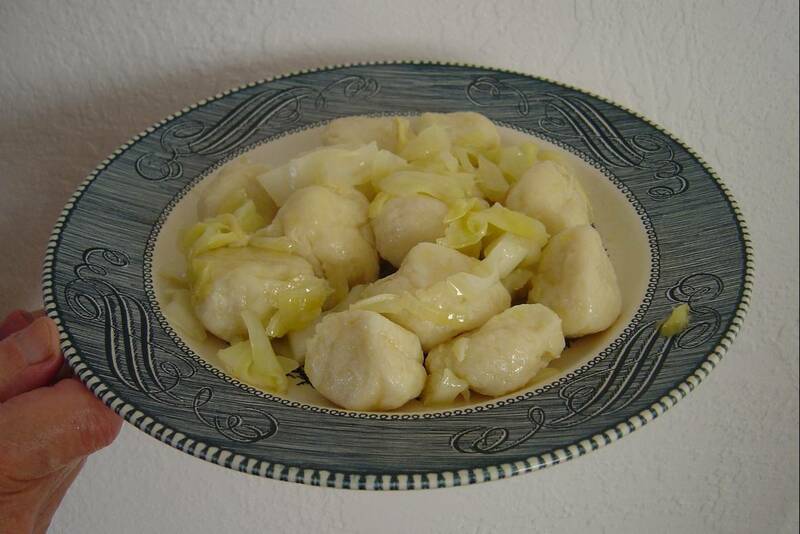 Cooking with fresh cabbage is economical and sweetens up recipes in a surprisingly delicious way like in this recipe I want to share with you today with my Mashed Potatoes-Cottage Cheese Dumplings. I had some leftover mashed potatoes in the refrigerator that I wanted to use up besides more cabbage so I turned it into a dumpling dinner. I like to add cottage cheese and eggs for protein besides the mashed potatoes and flour when making my Mashed Potatoes-Cottage Cheese Dumplings. Another nice thing about this recipe is the lighter texture than traditional dumplings due to the baking powder. Let your children give you a hand when you turn the dough onto a floured surface. Shape the roll and cut it into little pieces. If you don’t mind a little flour on the flour, it is a wonderful learning experience to show your child how to take a piece of dough, roll it in some flour, and then work with him or her as a team to form the dumplings. The cooked dumplings will be added to some finely chopped onion and thinly sliced cabbage that were browned in olive oil and a tablespoon of a margarine. This combination will be so tasty over your dumplings. You can serve them just with the onion and cabbage mixture or add a sprinkling of Parmesan cheese or a little sour cream is also fantastic. Seriously, I have never eaten so much cabbage in my life and really think it helps stretch your food budget. However, I will be buying more monster heads of cabbage! Honestly, you will love the natural sweetness and texture it provides to your recipes. Form a long dough rope. Get a knife and cut into little pieces. If this is still sticky, add a little more flour to your work surface and guide those small cut pieces, a little at a time into that flour. Shape and roll those floured pieces, one at a time, in the palm of your hand. Put the finished dumplings in a pot of boiling water. Cook until they start to come to the top of the pot. Drain into your colander. Then add the cooked dumpling to the frying pan that you already browned the chopped onion and thinly sliced cabbage in your olive oil and tablespoon of the margarine. Coat those dumplings first and then serve. Previous Post If Dull Scissors Give You a Problem Try This! Wow, this sounds great. I would like to try with tomato sauce. Thanks for sharing this! The big challenge for me now that it's just Hubs and me at home and I'm no longer cooking for teen age boys, is what to do with leftovers. I had no idea I could use mashed potatoes as dumplings! BTW–I love cabbage!